The imagePROGRAF iPF6450 is ideal for photographers, artists and graphic designers. Equipped with LUCIA EX 12 color inks, the printer supports ink tank sizes of 130ml and for the first time, 300ml, and the new, sub-ink tank along with the standard accounting manager feature keeps some ink in reserve to allow for tanks to be changed without interrupting a print. In highest print mode, the order of ink application and layering is optimized to maintain the highest print quality with fewer passes, making this mode twice as fast compared to previous models. With these particular models only, customers can take advantage of a special new feature called the Color Calibration Management System which allows for color calibration targets to be created when using the iPF6450 along with the optional Spectrophotometer Unit SU-21 accessory. The Color Calibration Management System not only can be shared across all new iPFX400 12-color printers in a fleet, but the included software also allows for all printers in your network to be monitored from one central location. 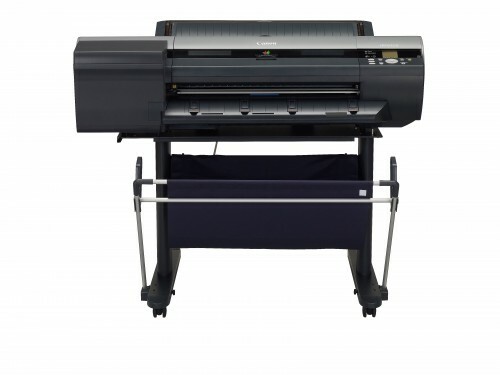 The imagePROGRAF iPF6450 24-inch large format printer was designed for professionals in the graphic, fine art, photography and proofing markets that seek the highest possible standards for quality-control and image reproduction. An incredibly large color spectrum is produced by the 12-Color LUCIA EX pigment ink set, which also provides better scratch resistance and smoother gradations. The new Multi-sensor included with this printer provides improved color density detection and allows for a full calibration to be completed within 15 minutes, with the ability to use non-Canon branded media. The imagePROGRAF iPF6450 printer offers companies the optimum balance of ultra-high-quality printing and performance.